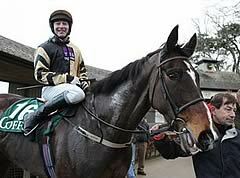 On His Own fell in both the 2012 and 2013 runnings of the Crabbie’s Grand National. He Went down by a short-head to Lord Windermere in the 2014 Cheltenham Gold Cup, and is a dual winner of the Thyestes Chase at Gowran Park – scoring impressively in 2012 and 2014. Returned to form when just touched off by stablemate Boston Bob in Grade 2 Bobbyjo Chase at Fairyhouse on February 20th, but finished a well-beaten eighth behind Don Cossack in the Cheltenham Gold Cup last time out. On His Own is a classy sort and stays really well. Has a decent strike rate over fences, but is not getting any younger and is yet to complete in two Grand National attempts.